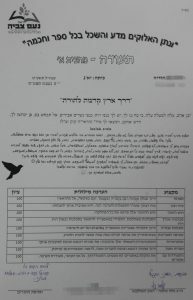 The following was written by a teacher from Noam Tzvia high school in Afula. 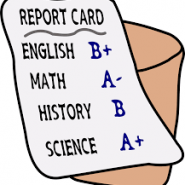 Report cards are supposed to give a summary of academic achievements, but the following report card is, in my opinion, a lesson in itself, a lesson about what is truly important in life. Hodaya bat Ilana, an 11th grader at our school, was injured in a car accident during her summer vacation. Her life was in danger, and thank G-d, now she is recovering and making progress. She has been absent from school for this entire year, and she has only come to visit once, straight from the Rehabilitation Center where she is a patient. So what kind of a report card could one give to Hodaya bat Ilana, if any? A+ in coping with challenges. Her parents too received an excellent evaluation. That is just so beautiful and brought tears to my eyes. So often I can get the impression (perhaps wrongly) that schools are just so overwhelmed that if a child is off school (for any reason), then in a way then “out of sight, out of mind”. This is a really wonderful example of a really caring school. Thank you for sharing.